We’d love your help. 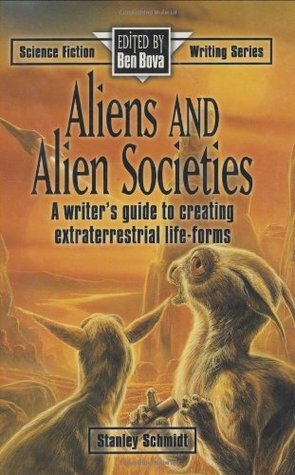 Let us know what’s wrong with this preview of Aliens and Alien Societies by Stanley Schmidt. To ask other readers questions about Aliens and Alien Societies, please sign up. You will never watch a science fiction movie or read a science fiction book about aliens the same way again. I am forever ruined, but gained a deeper appreciation of the science involved in creating fictional alien species. This book definitely leans towards hard science fiction. Coming from a humanities and social science background I felt a little discouraged as a writer reading through some of the technical chapters. What do I know about physics or chemistry? I have a vague understanding of a You will never watch a science fiction movie or read a science fiction book about aliens the same way again. I am forever ruined, but gained a deeper appreciation of the science involved in creating fictional alien species. This book’s got everything. Science, language, lifestyle. It’s over 20 years old now, but it still holds up remarkably well. What a wonderful resource! It really helps you think about making them alien, and not just Star Trek rubber forehead alien. This is a book that I’ve had on my shelf for many years, and it will continue to stay on my shelf for years to come. A timeless classic! Very thought provoking on how to construct alien worlds and cultures. Gives good resources to explore further too. I thought this was an excellent book. Schmidt covers a broad swath of ideas for creating aliens and societies, as well as providing useful case studies - analyzing many works of fiction, and describing various approaches to the challenge. This is another book I'm sure I'll refer to regularly. Awesome for what it is, but not useful for a fantasy writer (oops). It gave me a few great ideas for shaping up my novel, however, so it wasn't wasted time. This book is just SO TOTALLY AWESOME!!! A must for anyone who appreciates science fiction. 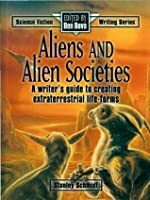 I wanted to create my aliens and I found this book to be incredibly helpful. Another great reference book. Keeping it handy as I write. I would classify this book as essential reading for the writer who wants to create worlds that could actually exist, based on existing knowledge, but doesn't know where to start researching. As a science-fiction writer I found this a valuable resource. It explained concepts in a easy to understand manner while laying out the foundational science behind them.